Why do deer in a group, when startled, suddenly bolt away together and never collide with each other? It's because these deer have an inner compass that allows them to follow a certain direction in order to make their escape. Their getaway is almost always along a north-south axis, thanks to their ability to sense the magnetic field, says Petr Obleser of the Czech University of Life Sciences in the Czech Republic. He and Hynek Burda of the University Duisburg-Essen, Germany, are lead authors of a study in Springer's journal Behavioral Ecology and Sociobiology. Flight distance and flight trajectories relative to danger have been studied in different types of animal species. Little is known, however, about how animals living in groups synchronize their escape direction when frightened, in order to avoid collision and keep the group together. This study is the first on the escape behavior in animals to consider the role of the magnetic compass directions. Obleser's team turned to roe deer (Capreolus capreolus), a species of deer commonly found grazing in flat open agricultural land in Europe. The researchers conducted field studies in 60 separate areas in three hunting locations in the Czech Republic. This was done at different times of the day, for 46 days between April and August 2014. The animals were monitored by experienced wildlife biologists and rangers. They noted the direction in which the deer's bodies were aligned while the animals were still undisturbed grazing or standing. Once the animals were startled, the observers noted the direction in which they escaped, and how this route correlated with the direction from the threat and to their next place of shelter. 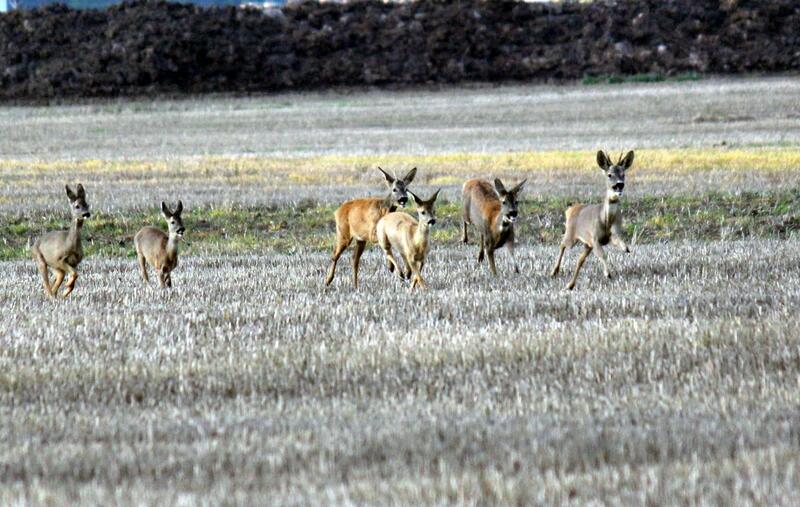 It was found that roe deer tend to align their bodies along the north-south axis when grazing. When startled, the animals generally fled away from observers. They did not merely make their getaway in the direction directly opposite to the approaching threat, but consistently did so north- or southwards. In fact, they seemed to actively avoid escaping westwards and eastwards, says Obleser. Wind direction or the position of the sun had no influence on the direction of their escape route. Such a north-south preference was more pronounced in groups than in single animals. "This suggests that an important function of this behavior is to coordinate the movement in the group, to keep the common course of escape when frightened and to maintain the cohesion of the group," says Obleser. The researchers believe that the tendency of deer to align their bodies with respect to a north-south magnetic field line confirm that they are magnetosensitive and magnetoreceptive. This assists the animals to "read" and comprehend the mental maps they hold of the landscapes they occupy. They also speculate that escape in a known direction eases spatial orientation and helps the animals to return later to the same place from which they fled. This might for example be important for a lactating female roe deer that has been hiding her fawn in tall grass or crops nearby.